This apparently unremarkable and blurred photo on the right is pivotal in the story of Carnival Glass – much more so than a cursory glance could possibly reveal. It was the finding (and sale) of this single piece of Carnival Glass that funded the late Bob Smith’s voyage of glass research and discovery; it took him to India and then on to Europe. And we were privileged to work alongside Bob on his return home to the USA. Together we researched and documented Carnival Glass making in India and in Czechoslovakia, as well as updating and re-writing much of the production in Finland too. The discoveries played a crucial role in recognising where Carnival Glass was made around the world; they overturned some oft-repeated (but unproven) fallacies by providing factual, corroborating details. Today, we do not hesitate to refer to the Carnival makers in India, especially Jain - but it is so important to recognise that without Bob’s detailed research, much of his information would have remained a mystery. ​Fortunately, Bob kept meticulously detailed records, which he sent to us to ensure that they would not be lost to the Carnival Glass world. Bob's over-riding aim was to preserve intact his research, his records, and crucially, his Carnival tumbler collection. ​So, let’s take a look at this piece of glass. Bob found it one Sunday in April, 1993. The temperature was in the 50s, overcast but not raining, as he set out from his tiny rooming house apartment on Beacon Hill on one of his regular hunts round the Boston antique shops. On that day, he chose to visit the Antique Co-op on Spice Street in the Charlestown area. He simply couldn’t believe his eyes when he saw a pastel Rose Show plate. Not just any pastel … it was ice green opal ... an absolute rarity! Bob’s original photo of the plate is the one shown above, and below on the left, is the actual receipt that he received for his purchase of it. Bob sold the beautiful plate for a large sum of money, which he then used to pay for his subsequent round-the-world Carnival research trip. It’s a poignant time for us to be writing about Bob, as this month marks a year since his passing. Bob was our dear friend as well as our research colleague. Over the twenty years that we worked so closely together, he emailed and shipped to us huge quantities of correspondence. This Big Butterfly tumbler was one of Bob Smith’s most roller-coaster-ride acquisitions! ​Here’s what happened some eight years ago (in 2010). Bob had set his heart on this special marigold tumbler, and he made his bids “live” on the phone, but he believed that he had been outbid. For two whole days, he resigned himself to having lost out. He tried to put a brave face on the situation, but in his heart of hearts, he wished things had turned out differently. Then, two full days later … *What A Surprise* … Bob received the news that he had indeed secured the tumbler! Bob's marigold Big Butterfly tumbler. “Sometimes a comparatively short time suffices to set a word adrift from its original and true meaning and to cause people to forget what its real significance is. This is illustrated in our word 'tumbler', meaning a drinking glass which sets squarely down upon the table, without a 'foot', as in the case of a goblet. What a 'tumbler' really is may be inferred from an extract from a gentleman's diary written in 1803, which also throws light upon the social customs of the times. ​The entry is as follows: 'Had a few friends to dinner. Tried my new tumbling-glasses. Very successful; all got drunk early'. An 1846 illustration, courtesy Wikimedia. We recently came across this splendid 1911 glass journal ad for Imperial, and we wanted to share it with you. The full sized ad is on our website, but here is the part that shows the actual glass. The vases are what we know as Imperial’s “Morning Glory”, and both appear to be the funeral vase size, swung to different heights (assuming the illustration is reasonably representative). Note that the smaller 15” high vase is described as a “sweet pea vase”. These items were targeted specifically at women, as the text in the ad reads: “No normal woman can resist temptations like these vases of classic form, in beautiful iridescent Imperial glass, at TWENTY-FIVE CENTS, nor the Punch Sets – large bowl and six cups – at NINETY-EIGHT CENTS. This, also, in our famous red iridescent finish”. 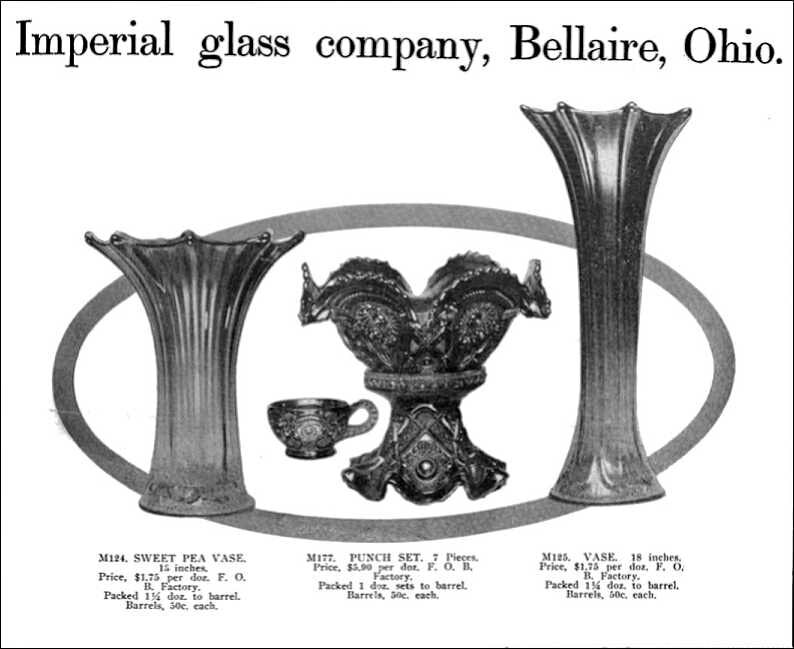 ​Above: Imperial's Morning Glory vases courtesy Seeck Auctions. Note that in the ad, the punch set is described as being “7 pieces” and in the text is referred to as a “large bowl and six cups”. The inference appears to be that the stand and bowl are in one piece. Of course, we know that the stand and bowl are two separate pieces! A curiously misleading description. The ad was part of a series placed by Imperial's New York Representative, Cox & Lafferty during 1910-1911. They are a fascinating insight into Imperial's selling methods, and we feature several of them on our website. All the ads are linked from this one page: Sell me some Imperial Glass! 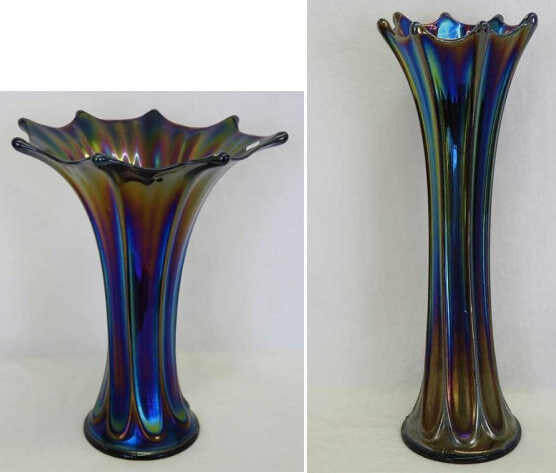 Thanks to our friend and researcher, Claudio Deveikis, we are able to show you this fascinating Carnival Glass that was made by Esberard in Brazil. Claudio recently discovered several shapes in this lovely pattern, and was thrilled to see several of them had a trademark on them … ESBERARD. The pattern itself is even more intriguing, as it appears to have been inspired by various versions of an earlier European pattern. Following our feature on the Contemporary Fenton version of Northwood’s Grape and Cable tobacco jar that we showed in issue #41 of our NetworK ezine, our friend and Contemporary Carnival expert, Tony DeMichael sent us these photos of three stunning examples of pieces made by Fenton. They are, left to right: decorated red Carnival, decorated satin Burmese, and red Carnival, which Fenton described as "our rich Marigold Carnival on Ruby glass". Aren’t they fabulous? Many thanks to Tony for sharing. When we admire our Classic Carnival Glass, it’s worth reminding ourselves of the period in time when it was being made. Fortunately we do have some retail catalogues to help. Here is an extract from the Sears catalogue of 1908 – “The Superba Ball Bearing Washer” - so easy to use that “even a child can run it” … apparently using only one hand and dressed in her Sunday best! Don't put your Carnival in it! Want to read the Back Issues of NetworK online? Here they are: NetworK Back Issues.